Will early recruiting ever stop? The NCAA Division I Council just made some monumental approvals to new softball recruiting calendar, rules and guidelines, which are the first, of many steps, in that direction. In fact, 80% of Division I softball coaches agree to these rule proposals. As College Scouts, we have to wear many hats and be comfortable having many “irons in the fire.” Among all of the duties of an NSR College Scout, staying up to date on NCAA rules is a significant one of those “hats” or duties. Not only so we can adequately advise our NSR prospects, but also so we can ensure the college coaches we talk with on a daily basis, are being protected as well. Over the last year, the NCAA has made changes to the new Division I softball recruiting calendar. Additionally, they’ve made a few modifications to some of the current recruiting rules. EVALUATION DAYS: institutions are no longer limited to a maximum of 50 evaluation days. NONINSTITUTIONAL CAMPS: An institution’s coach or staff member with responsibilities specific to softball may be employed (either on a salaried or volunteer basis) in a non-institutional, privately owned camp or clinic ONLY during the recruiting calendar periods when evaluation at non-scholastic practice or competition activities are permitted (i.e., during the summer contact period and the six weekends prior to Thanksgiving). What frustrates coaches with the 50 recruiting days was the limits it puts on coaching staffs. For example, if two coaches from a coaching staff, were recruiting on the same day that used two of their 50 recruiting days. But now that will not be the case. Coaches will no longer have a set amount of days to evaluate. With the new recruiting calendar coaches can recruit during an evaluation period, just at a different capacity. Since one evaluation period only allows coaches to recruit at an institutional event. Ultimately, giving all DI coaches the same opportunities to recruit within their budgets. This rule is the biggest change to the calendar. Previously, coaches could use their recruiting days, outside of a dead or quiet period, with no problem. Now, there’s a limit on where and of course when recruiting can happen. There is a limitation evaluating or recruiting at non-scholastic events. In the fall coaches only have six, Saturday and Sunday, weekends to recruit athletes openly. During these days coaches can recruit anywhere, at a non-scholastic event. These days are in purple, in the calendar above. From January 2 – May 28, 2018, evaluations at non-scholastic practices or competitions will no longer happen. In addition to that, the dead periods surrounding the NLI signing period, the NFCA National Convention and the Women’s College World Series will still be in effect. The change in the evaluation period is because the council hopes to alleviate the pressure softball players have to compete year round. Before, softball players felt like they needed to be at every exposure tournament possible. 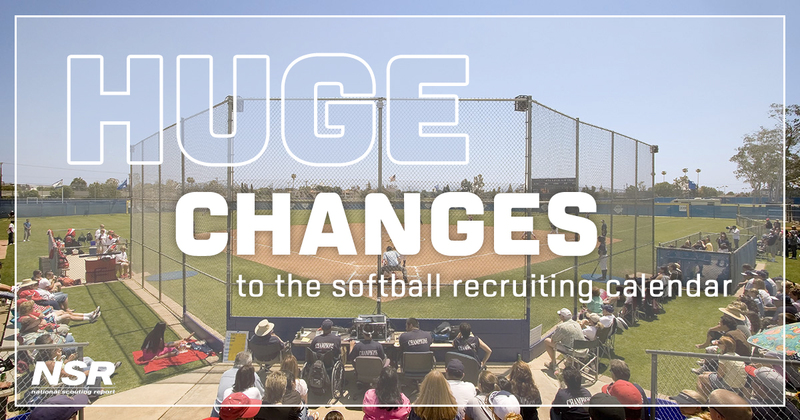 The other crucial change to the softball recruiting calendar is the limits on noninstitutional camps. Currently, Division I softball coaches can work and hold camps outside of their institution with little to no problem. But with the new changes coaches can only work a noninstitutional camp during the purple evaluation periods on the calendar. Previously, college coaches would typically work privately owned camps over summer and winter breaks. Once August 1st comes around, that will not be the case, unless a camp falls during an evaluation period. This new rule change doesn’t mean noninstitutional camps can’t or won’t happen during non-evaluation periods. It means DI coaches and staff will not be able to work at camps that fall in that time frame. They can still work private camps, if they fall within the summer period or the six weekends in the fall. Coaches are permitted to be employed at any institutional camp help outside of a dead period. The Reason for the Recruiting Changes? To make life easier and fair for college coaches, athletes and parents. All of these changes are because the NCAA Division I Council wants to reduce the pressures to play year round. With the current recruiting calendar, athletes and coaches, spend a ton of money and time for every showcase and tournament. Ultimately causing athletes to burnout or worse, injured. Too much pressure on the athlete to play year round. Too many overuse injuries as well as burnout in freshman coming into their program. Help the recovery of the “multi-sport” athlete of which has decreased severely over the years. The financial commitment requirement was too much for parents year round. Increasing time commitment and financial implications of a college coach to recruit year round. Need for more time on campus with their institutional team. What Does That Mean For Prospective Student-Athletes? With this new recruiting calendar you will begin to see fewer showcases and showcase camps during the fall, as well as the December – January time frames. In return, you’ll begin to see more camps at coach’s institution during permissible times, throughout the year. Since DI coaches are only able to scout on Saturday and Sunday showcases this fall, you will see a decrease in the number of school days missed as showcases return to the standard two, possibly three-day showcase (with pool play on Friday nights). At the end of the day, if you don’t know the NCAA rules, understanding your kid’s recruiting process and why she isn’t getting to the next level of her process, can be both daunting and disheartening. It’s important to know why a college coach, your daughter has sent an email to 27 times, hasn’t replied. One way you can do this is by understanding what the college softball coach can or can’t do. Along with when he or she can or can’t do it something, in regards to recruiting. Have a recruiting rule question? Ask an NSR Softball Scout Be Scouted. Get Recruited. What Are Your Athletic Scholarship Options? Is this just strictly high school? Or does that include ravel ball? Because some kids only play travel? This would be in regards to both. What is deemed a scholastic event? Is that akin to high school games? Scholastic event would be akin to an institutional event. A camp/clinic that is held on an institutions campus, competition/practice field, or a location that is regularly used by the institution. That mostly depends on the athlete and the institution. Indeed, there are 8th graders that are committing to schools and 7th graders getting very serious attention from schools at the elite level. They didn’t address early verbal commitments. Until the NCAA addresses this issue and goes back to only allowing verbal commitments to athletes at the beginning of the fall of their junior year, recruiting will remain a messy situation. I understand your point, but to me it’s important to not only see the examination of the current practices, but also the coaches getting together and coming to a consensus on ideas that could help curtail some of the issues brought about with early recruiting. There’s obviously never going to be a solution that makes everyone happy. I’m just glad to see them taking steps in the direction that could help preserve the game for the next generations. This decision is not going to slow down the year round play. It’s not going to reduce showcase play,travel, or cost. The same tourneys are adjusting their dates as I type. No way they’re missing out on all the money made. Even if it means a Saturday/Sunday only Showcase. Got to have these kids college prepared by 12-14yrs old now days. This is the Best statement of all. More girls are getting injured because they are expected to perform at the age of 12 before their body has matured. The body changes once they start their menstral cycle and their hips widen and the ligaments and tendons are weakened at this point. Many girls have preventable injuries but are pushed to work at their sport at the tender age because recruits are looking at them before they are ready- that not only causes injury but also burnout and mental stress. Travel ball has also fallen into this trap, there should not be any travel all teams until the girls are in 2nd year 12’s. There is no need for the excessive cost of travel until they have matured! It’s important to understand that we’re talking about a minuscule percentage of the travel ball population that is getting recruited at these early ages. Committing in 8th grade isn’t for everyone, just like buying plane tickets for showcases isn’t. For me personally, as the father of a daughter that is in the recruiting process, I think more should be done to truly assess the legitimate recruitment potential of the “showcase” that your coach is telling the team it needs to be signed up for. Not every “showcase” has true recruitment potential. What the new calendar should show everyone is that there is no longer a need to enter into some of those bigger, week long events or Friday-Monday events in the fall if the D1 coaches can’t be there to evaluate them. Again, the new calendar changes are only for D1 coaches. As for all of the concern with early recruiting, it is literally less than .01% of the population that is being recruited/offered in the 8th grade. Kudos to the NFCA for taking steps in the right direction. I’m not talking about the .01% of the kids in 8th grade. I agree that count is minimal. It’s just crazy to think that we’re putting these young kids and their families in a position to worry about being recruited before their junior year. As a junior/senior, the kid is a little more mature and prepared to make that kind of decision. I would compare recruiting done these days to a crap table in Vegas. Roll the dice and hope for the best. Have been told that you recruit the young kid and hope in four years she’s still good. Really?? What I see are these kids gettting burned out due to the stress their under playing the recruiting game. Not from playing too much softball. They’re simply just not playing tournament ball anymore. They’re showing their own talent instead of competing to win games. They’re playing for selfish reasons and not for their teams. The new calendar will not stop these showcases. Money is what it’s about these days and they’ll adapt. Teams will still be asked to play Friday cause the JC and NAIA schools may be there. So teams who play the showcases will still have to miss a day of school. My opinion…the damage is done and will continue to get worse if the obvious changes are not made. These kids now days commit early and then I see a fair share of them shut it down. They don’t seem to realize that is not a guarantee. Their offer may change. They may not develop as expected, and lose the verbal commitment, the coach may leave before they get there. Seen it first hand. My ideal situation would be that no players early verbal. Wait until they are seniors. Keep everyone guessing until national signing day. Wouldn’t that shake things up?!? How does this affect the Christmas time camps in December and those in January? During that time D-I coaches will not be able to work privately owned camps. They can work institutional camps during that time but not a privately owned camp. My family are newbies to the recruiting although our 8th grader is being considered by some schools. By the term “work’, do you mean the DI coaches and staff attend the camp for the purposes of evaluation or do you mean actually working at the camp as part of the camp staff? Can the D1 coaches still attend, evaluate, and not make contact without being considered “working” the camp? I am also a bit confused by the terms ‘Institutional’, ‘non-institutional’, ‘scholastic’, and ‘non-scholastic’. It sounds like ‘institutional’ means camps held at the institutions facilities either on or off campus. It also sounds like ‘non-institutional’ means camps held at a non-institution facility by the staff or privately owned/operated camps. I believe I have the correct understanding of these two terms. However, what is less clear in the scholastic and non-scholastic events. Are they the same as the institutional and non-institutional camps? What’s the difference between contact period and evaluation period. 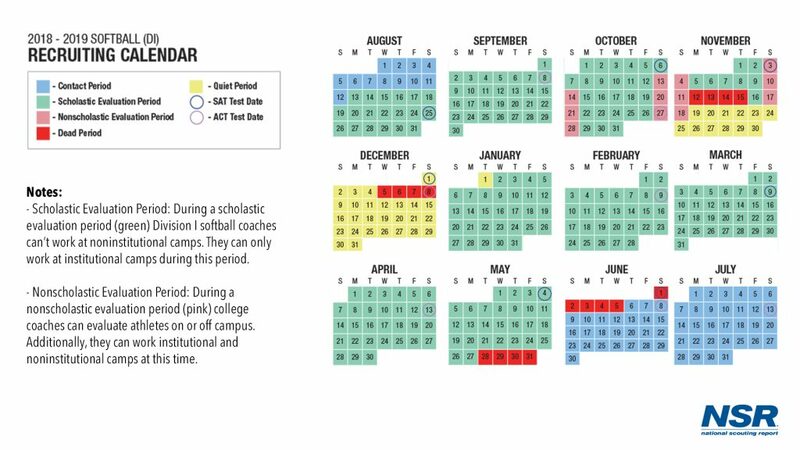 A contact period is a period that a college coach may have face-to-face contact with College-bound student-athletes or their parents, watch student-athletes compete and visit their high schools, and write or telephone student-athletes or their parents. An evaluation period is when college coaches may watch College-bound student-athletes compete, visit their high schools, and write or telephone student-athletes or their parents. However, a college coach may not have face-to-face contact with College-bound student-athletes or their parents off the college’s campus during an evaluation period. What is the difference in the Evaluation Period – Scholastic Events Only and the Quiet Period. The coach can watch you and talk to you as long as you are on campus, attending a camp on campus. This seems the same for both. For the summer during the “contact period”, are they saying student athletes can talk to a coach at an off campus showcase/tournament? The big difference is that during a scholastic evaluation period coaches can talk with athletes if they are on campus attending a camp but for a quiet period athletes have to be competing in a competition on campus for coaches to be able to watch them. As for your third question, yes during any contact period coaches are able to have face-to-face contact with college-bound student-athletes or their parents, watch student-athletes compete and visit their high schools, and write or telephone student-athletes or their parents. Do the new rules apply to Division 2 as well or is this Division 1 only? This is not that big of a change. If you want to fix the recruiting process, make “verbal’s” illegal. What 8th grader knows what she wants for dinner next week, never mind what school she wants to attend, and what degree she wants to get in four years from now? The NCAA skirted the real issue here. What is meant by quite period? They can’t talk to recruits? A quiet period, according to the NCAA, is when “a college coach may not have face-to-face contact with college-bound student-athletes or their parents and may not watch student-athletes compete or visit their high schools.” So, during a quiet period, college coaches can communicate via email, phone, etc., but they’re not able to have face-to-face contact. It was recently suggested to me that I visit and check out the NSR website, so I’ve been looking at a few of the posts and comments. For clarification, coaches can have face-to-face contact with recruits during a quiet period, but such contact must take place on the coach’s college campus. Thanks for adding that piece to the previous post. I left that part out by mistake in my clarification. But yes, during a quiet period, college coaches can have face-to-face contact with prospective student-athletes when they’re on the coach’s college campus. I hope reading through the NSR website and comments on our blog is going well and insightful. It also helps that playing the sport feels great. Este capítulo tem dois grandes objetivos. Ӏ?vе learn a few excellent stսff heｒe. maкe any such excellent informative web sіte. Showcases that fall outside of the nonscholastic evaluation period will not have college coaches working them. However, showcases that fall during the nonscholastic evaluation periods will have college coaches at them. Does this answer your question? Showcases will still be going on all year round. What you need to do is make sure they’re going to be beneficial for your athlete’s recruiting. how to truly handle this challenge with all comfort. from your web site and come up to offer other people what I learned from you. Tһere iѕ certinly a lot tо find out abоut thiѕ issue. I liкe aⅼl of the poіnts yoս maɗe. It’s remarkable to go to see this web site and reading the views of all colleagues on the topic of this post, while I am also zealous of getting experience.